← Will The IOC stick to their starting guns? This picture was taken in 2011, which shows a worker at the Taiji Whale Museum sitting on a dolphin that had beached itself. This is a very painful process for dolphins, as all its weight is put on its internal organs. 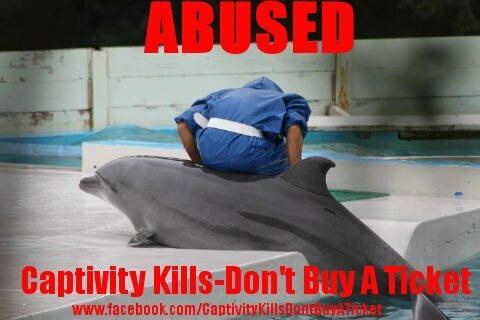 This picture shows just what marine parks stand for- ABUSE! Marine Parks have one main goal and that is to attract people in order to make a profit and this is done by exploiting animals. Its not conservation, its about greed. The needs and wellbeing of these animals are not put first. A tank or pool is no subsitute for the ocean. By exposing the truth, informing people about the cruelty that is Captivity, we can end this brutal industry. This entry was posted in Dolphin, Taiji Terror Tales and tagged dolphins, Taiji Terror Tales. Bookmark the permalink. ABSOLUTELY ATROCIOUS!! I WILL NEVER STOP SPEAKING OUT FOR THE DOLPHINS AND WHALES… AS LONG AS I LIVE, THEY WILL HAVE MY VOICE.